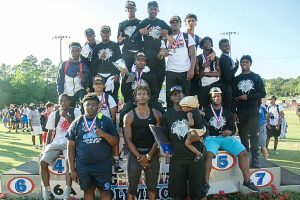 Three gold medal and three silver medal performances keyed the Cedar Grove Saints to a 74-39 blowout victory over Blessed Trinity to capture the programs second consecutive Class 3A boy’s state track title at Memorial Stadium in Jefferson last weekend. Johnny Thomas scored 13 points in the field events, including a silver medal finish in the shot put (50-00.50), to kick start the Saints’ title defense. The Saints served notice in the first track event final on Saturday by winning the 4×100 meter relay for the second consecutive season in a time of 41.91 run by the squad of Andre Burrell, Jacquez Cooper, Kortney Cox and Israel Spivey. Burrell took silver in the 400 meter dash (49.30) and Jadon Haselwood took silver in the 110 meter hurdles (14.93) as the Saints began to pile up the points and take the lead in the standings. Jesse Reverio grabbed the gold in the 300 meter hurdles (38.65) and Haselwood added a bronze to his collection with a time of 39.62 in the event. The Saints closed out the championships with their fourth consecutive state gold medal in the 4×400 meter relay with a time of 3:22.57 by the team of Burrell, Reverio, Spivey and Mathew Young. The victory extended DeKalb County’s string of at least one track state championship to 10 consecutive years. McNair picked up one point to tie for 42nd overall as Joseph Mitchell finished eighth in the 400 meter dash (51.29). DeKalb County had a pair of Top 20 finishes in the Class 4A Boy’s State Track Championships at Jefferson. Arabia Mountain led the way picking up 16 points which was good for a 17th place finish out of 41 teams. Tyler Jones complied 10 points for the Rams with his best finish coming with a silver in the triple jump (45-10.75) and a seventh place finish in the long jump (21-11.75). Michael Willingham added a bronze in the discus with a toss of 158 feet, 4 inches for the Rams. Chamblee finished in 20th with 10 points led by fifth place finishes by Tanner Duffin in the discus (150-04) and Will West in the pole vault (13-00.00). Columbia finished in a tie for 26th behind Bobby Tillman’s third place (bronze) in the shot put (52-04.50).